Barcelona (pop. 1.5 million) is the heart and capital of the region of Cataluña in the northeast corner of Spain. The origin of this Mediterranean city goes back more than 2,500 years - ruled by Carthaginians, Romans, Visigoths, Moors, and Franks until it finally became part of the Spanish empire in the 17th century. Barcelona is, for all intents and purposes, now a bilingual city as inhabitants of the region speak both Castilian Spanish and Catalán, the official language of Cataluña. 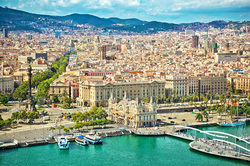 Barcelona offers visitors eccentric creativity, cultural diversity, and endless amounts of energy. The architecture in Barcelona is stunning and unique, ranging from medieval gothic castles to the mosaic buildings of Antonio Gaudí. Also known for the cubist and surreal artists Picasso and Dalí, Barcelona will satisfy art lovers of all types! Bordered by wooded hills, Barcelona's surrounding area offers an escape from the bustling city life. A few hours away are the Pyrenees Mountains as well as the vineyards and orchards of the Cataluña region. 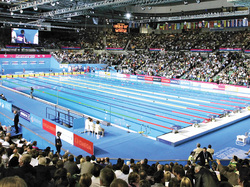 Barcelona was the host city for the 1992 Olympic games, and many of the venues are the same that will beused the the 2013 FINA World Championships. The celebration of the 1992 Olympic Games had an enormous impact on the urbanism and external projection of the city of Barcelona. The Games enabled billions in infrastructure investments that are considered to have improved the quality of life and attraction of the city for investments and tourism, making Barcelona one of the most visited cities in Europe after Paris, London and Rome. The nomination of the city as organizer was the spark that led to the application of a previously elaborated ambitious urban plan. Barcelona was opened to the sea with the construction of the Olympic Village and Olympic Port in Poblenou, a decayed neighborhood. 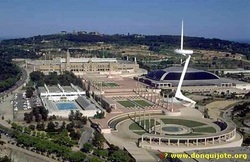 Various new centers were created, and modern sports facilities were built in the Olympic zones of Montjuïc, Diagonal, and Vall d'Hebron. The construction of ring roads around the city helped reduce the density of the traffic, and El Prat airport was modernized and expanded as two new terminals were opened. New hotels were built and some old ones were refurbished. Barcelona also hosted the 2003 FINA World Championships. Many of the venues from the 1992 Olympics were updated and used for these World Championships. The Palau Sant Jordi, which was the site for basketball and gymnastics during the Olympics, was transformed into a state-of-the-art indoor pool facility. The Piscina Municipal de Montjuïc, diving venue that created such memorable images from the 1992 Olympic games, again provided unforgettable shots overlooking the city of Barcelona.